Our MP-10K is a general multipurpose kit which allows the user to conveniently dispense pastes and fluids of various viscosities of their choice. Each kit includes: Reusable Hand Plunger, Tip Cap, Manual Stopper, Syringe Top Cap Seal and two Polyethylene Tapered Needles. The XNS-2 (Set of 3-each of common dispensing needles and 3 syringe cups) is offered to help you select the required size. You can also order any Dispensing Needle size in packages of 25 or 100 pcs separately. (Example of P/N for 18 gauge tapered needle: for 50 pcs: XT-18-50 and for 250pcs: XT-18-250. To order different gauge just change 18 for required gauge size.). Dispensing tips are ideal for solder paste dispensing. 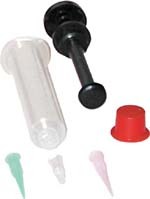 X-KAR Dispensing Tips included in the XNS-2 Dispensing Tip Set are made from high density polyethylene to include a Luer Lock hub and a taper tip. 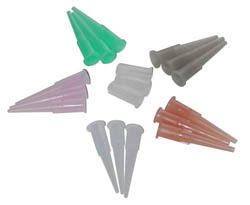 Color coding indicates tip orifice inside diameter that corresponds to the gauge. Easily cut by user when shorter tip is required. Shaped for paste and adhesive dispensing.